NEW YORK (WABC) -- You'll want to check your freezer after Perdue Foods issued a recall of some chicken nuggets sold in New York. 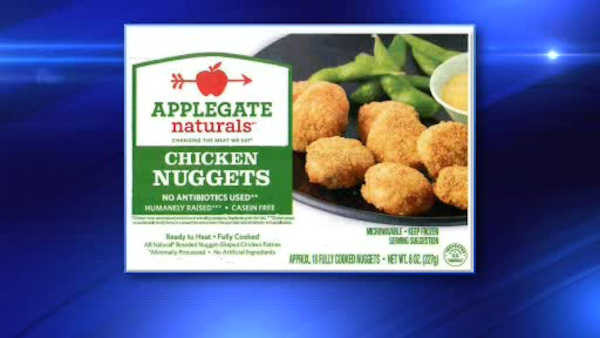 The recall affects Applegate Naturals chicken nuggets with a Best Before Date of Sept. 27, 2016. The company says more than 4500 pounds of chicken nuggets may have been contaminated with extraneous plastic materials. The recalled nuggets were also sold in six other states. The U.S. Agriculture Department said the nuggets were produced on Sept. 28, 2015. They are 8-oz. boxed packages containing approximately 18 pieces of "Applegate Naturals Chicken Nuggets" with Best Before Date 09/27/2016. The products subject to recall bear establishment number "P-2617" inside the USDA mark of inspection. These items were shipped to retail distribution centers in Florida, Georgia, Indiana, Massachusetts, Pennsylvania, New York, and Texas. The problem was discovered when the establishment received consumer complaints of small, solid, clear plastic inside the Applegate Naturals Chicken Nuggets. There have been no confirmed reports of adverse reactions due to consumption of these products, federal officials said. Anyone concerned about an injury or illness should contact a healthcare provider.